I can recall the heated debate between than treasurer Don Poyle and the PM and Secretary for treasury Dairi Vele when the submission to approve the acquisition of 10% shares in oil search was introduced and presented by PM O'Neill. I had a bad feeling about the whole matter from the beginning. Clearly the treasurer had been undermined as he sat close to the PM with a blank face while the secretary of his department presented the details of the submission including the complex financing structure of the UBS LOAN. If he was a white man we could have seen the color drain from his face. The atmosphere was tense. As soon as secretary vele finnished Don Poyle fired the first salvo at the PM. Being the straight forward, straight talking leader that he is Don did not mince his words. " I Will not support this submission as treasurer as we are now going to commit very substantial funds from LNG revenue into a speculative investment that Will only benefit oilsearch's take over of Elk entelope and deny our people much needed infrastructure development and social services." Secretary vele went on to expound the upside of the deal by telling cabinet how the oilsearch share price would hit US$9 when the gas started flowing in 2014. 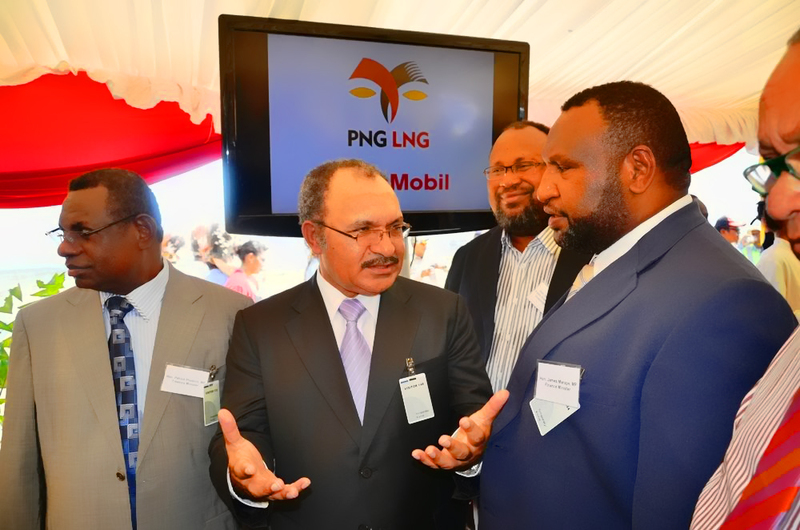 The PM chipped in to say something about a bonanza of investment in both the PNG LNG and the soon to be developed Papua LNG and defended the investment in the largest domestic oil and gas company as a safe bet. We were buying the shares at a discount and would hit it big when the shares went up to AUD$9 or even AUD$11 The PM convincingly assured cabinet. Still the treasurer stuck to his guns. " we are going to make a bad decision today. The government is not in the business of investing public funds for profit in private companies". He emphatically stated to a deaf cabinet. I could already read the look of disbelief and disappointment in the prime minister's face. The blood was drained from the light complexion of his face. He had been boldly challenged by the treasurer and leader of the 2nd largest party in the co alition government who was sitting just next to him. Flanking him on his right was the deputy PM Leo Dion, also a member of Don poyle's THE party. The PM was Tense. The billion dollar deal that he had personally put together was now opposed by the treasurer and was about to be thrown out the cabinet window. Many cabinet members supported the views expressed by the treasurer but to oppose the PM's submission was suicide. Most remained quite whilst a few asked questions. Some one asked whether a LOAN of such magnitude required parliament approval. We were told by both the PM and Secretary vele that loan approvals for the state was a prerogative of NEC. I spoke in support of the submission as minister responsible for SOE that was nominated to hold The shares in oil search and assume the loan liability. I had no choice. My heart was with the The treasurer but my head was with The PM. (In July 2016 my head followed my heart and I moved with the PPP to vote for Don Polye as alternate PM in a failed motion of no confidence in PM O'Neill). The treasurer sat in total silence while the recommendations in the submission were read out. The approval of those recommendations committed more than k3billion of LNG revenue to a deal that went bad. The opportunity costs of unfunded budget items from LNG revenue for the 2014, 2015, 2016 and 2017 budgets Will double the actual cost of the loss of the bad decision we made to invest public funds in a private foreign company. How about opportunities lost in growing the Kumul group of companies through investments in agriculture, tourism, fisheries and information technology and the brain trust?. K3billion is a huge load of money to lose in one single bad decision. Don Poyle's last stand to frustrate this bad deal by refusing to sign the UBS LOAN documents resulted in his removal as treasurer. The Prime Minister assumed the role of treasurer and affixed his signature to the bad deal. He and every single member of the cabinet including myself who endorsed the recommendations to commit very substantial public funds to a speculative investment deal that resulted in billion kina losses to the public purse are guilty of gross mismanagement. We should all be shot. This is a matter that always trouble my conscience and I have decided to tell you all the events of the meeting that exposed the true meaning of leadership in matters of crucial importance to the public good. Don Poyle stood up for what he believed was right. He was seen as a obstacle and removed. He has since been vindicated by the extra ordinary turn of events in late 2014 that saw the first flow of LNG to overseas markets and than the drop of oil prices from US$100 to US$55 than US$35 and the fall of oilsearch shares from the entry price of AUD$8.20 to AUD$7. We sold our shares at around AUD$6. This is a huge loss on top of what UBS and the deal makers had taken in large slices of the cake as fees, commissions and interests. The investigations by the Swiss banking and financial regulators Will hopefully uncover the full extent of the costs associated with the UBS LOAN and the irreparable damage to our public finances. More sobering is the fact that funds for much needed government goods and services for the development of our people from a non renewable resource have grown wings and flown away for good. I have written the best of my recollection the account of the decision to approve a decision that haunts me to this day.